, a learned Italian, was born at Venice, of poor parents of the lowest class, about the end of the fifteenth century. Alcyonius, or Alcyonio, was not his family name, but he is supposed to have adopted it, according to the custom of his age, to give himself an air of antiquity or classical origin. Whatever the meanness of his birth, he had the merit of applying in his youth to the learned languages with such success, as to become a very accomplished scholar. He was corrector of the press a considerable time for Aldus Manutius, and is entitled to a share in the praises given to the editions of that learned printer. 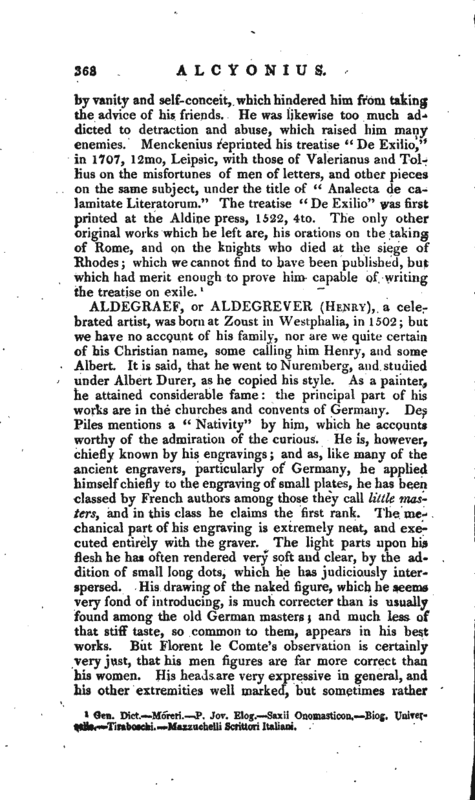 He translated into Latin several treatises of Aristotle; but Sepulveda wrote against these versions, and pointed out so many errors in them, that Alcyonius had no other remedy than buying up as many copies as he could get of Sepulveda’s work, and burning them. 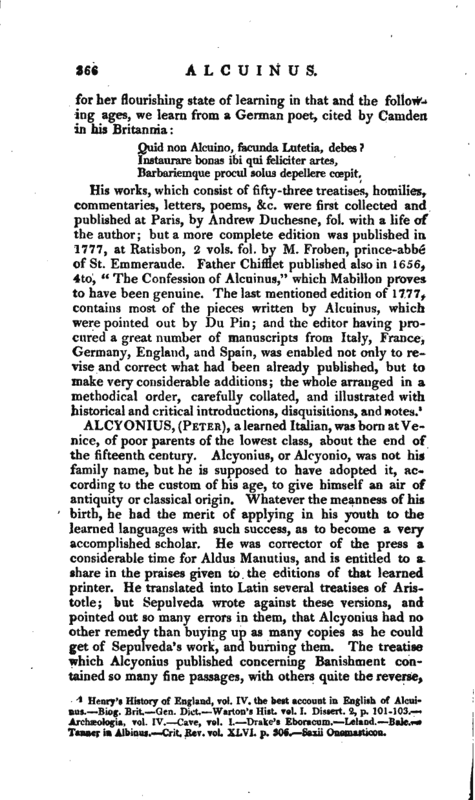 The treatise which Alcyonius published concerning Banishment contained so many fine passages, with others quite the reverse, | that it was thought he had interwoven with somewhat of his own, several fragments of Cicero’s treatise De Gloria; and that afterwards, in order to save himself from being detected in this theft, he burnt the manuscript of Cicero, the only one extant. 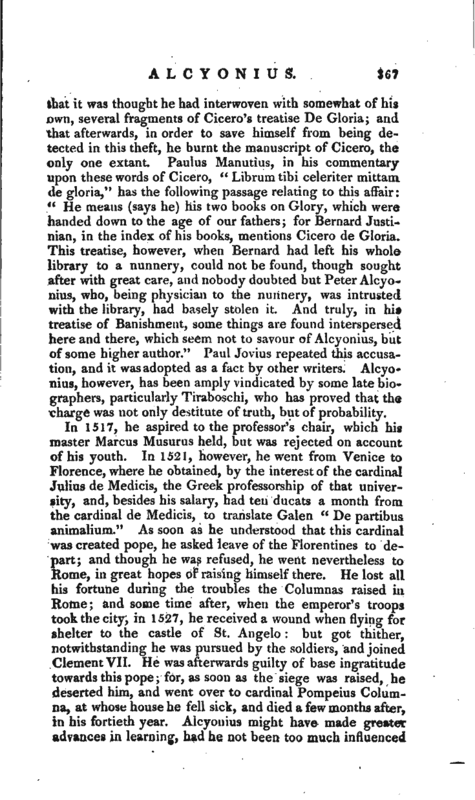 Paulus Manutius, in his commentary upon these words of Cicero, “Libruni tibi celeriter mittam de gloria,” has the following passage relating to this affair: “He means (says he) his two books on Glory, which were handed down to the age of our fathers; for Bernard Justinian, in the index of his books, mentions Cicero de Gloria. This treatise, however, when Bernard had left his whole library to a nunnery, could not be found, though sought after with great care, and nobody doubted but Peter Alcyonius, who, being physician to the nunnery, was intrusted with the library, had basely stolen it. And truly, in his treatise of Banishment, some things are found interspersed here and there, which seem not to savour of Alcyonius, but of some higher author.” Paul Jovius repeated this accusation, and it was adopted as a fact by other writers. Alcyonius, however, has been amply vindicated by some late biographers, particularly Tiraboschi, who has proved that the charge was not only destitute of truth, but of probability. 1 Gen. Dict. —Moreri. P. Jov. Elog. —Saxii Onomasticon, Bio. Universelle. —Tiraboschi. Mazzuchelli Scrittori Italiani.